Our topic this term is ‘All Things Bright and Beautiful, All Creatures Great and Small' We will be learning about different animals and looking at habitats. We will be doing lots of planting and investigating the conditions needed for growing plants. We will be learning through a mix of structured activities, guided and independent play in both the indoor and outdoor environments. 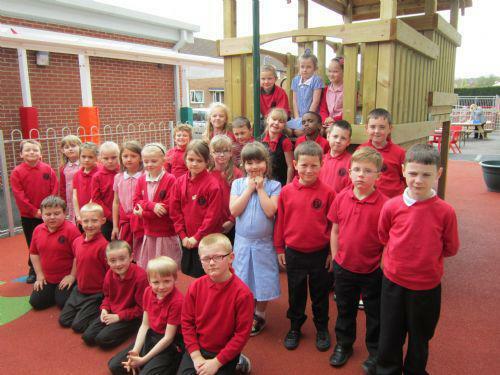 We hope the sun shines during the summer term so that we can do lots of activities outside! We have enjoyed learning about pirates this week. We played with the pirate ship and dressed up as pirates. We made treasure maps and Wanted posters. We found a caterpillar in our outside area and we have been learning about the life cycle of a butterfly. We have made butterflies using split pins to attach the wings to the body. We did this without any help - we are definitely ready for Year 3! They brighten up our windows. 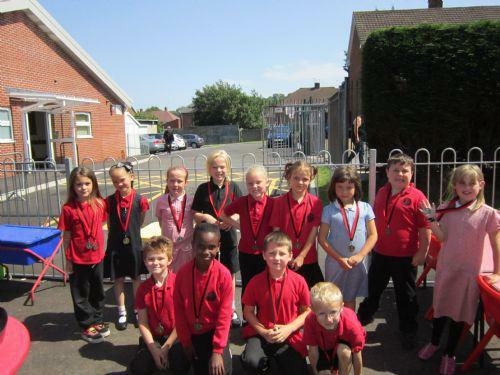 We all enjoyed taking part in Sports Day this week. Well done to everyone! We have had visitors in our class this week! Mrs Wheeler brought three Giant African Land Snails into school. We enjoyed watching, holding and learning about them. We wrote facts and looked carefully at them for our observational drawings. They were fascinating to watch! A big Thank You to everyone who came to our Summer Fayre this week. Everyone had lots of fun and it was a great success! We all enjoyed our visit to Margam Park Discovery Centre . Pond dipping was good fun and we found lots of different creatures and worked in groups to identify them. We walked around the farm area and saw lots of different animals including sheep, goats, ponies and donkeys. But our favourite was a very noisy turkey! We have been very busy this week making things for the Summer Fayre. We have made BFF photo frames using lollipop sticks and we had our photos taken with our friends. We also made door plaques for our bedrooms. We have been looking at the work of Georgia O'Keeffe this week. She is famous for her beautiful paintings of flowers. We were inspired by her work and took great care painting our flower pictures. We are very proud of our work! 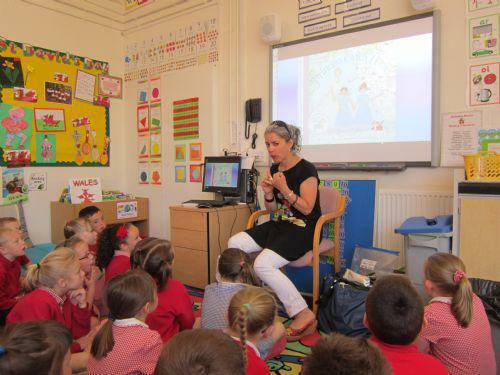 We were very lucky to have a visit from the author Sarah KilBride. She explained how she writes the Princess Evie and her magic pony stories and helped us to think of our own ideas for story writing. We have been enjoying the sunshine this week . Look at some of the things we have been doing in our outside area. Remember to water your sunflowers! We found a giant's foot in our class this week and we did lots of measuring with it! We measured the length and width of the corridor and then went outside to measure the bike shed. We counted the number of our own footsteps and found the difference. This giant has very big feet! Our broad bean seeds have shoots and roots and our sunflower seeds are growing. We need to look after our plants at home and bring them back to school after half term. Year 2 definitely have green fingers! We have enjoyed reading the story 'Jack and the Beanstalk' this week and we planted broad bean seeds in mini greenhouses to watch them grow. We need to make sure they have water and we are watching carefully to see whose seed is the first to have a shoot and roots. We have written our own beanstalk adventure stories imagining all sorts of exciting places at the top of the beanstalk! We are becoming very good storytellers! We have been learning about ponds this week. We used non-fiction books to find out about pond life. We looked in our school pond and saw lots of tadpoles, pond snails, pond skaters and we were very excited when we found a frog! We have sequenced pictures to learn about the life cycle of a frog and we'll keep checking the pond to see the changes in the tadpoles. Hopefully there will be lots of little frogs hopping around soon! We have enjoyed reading the story 'The Snail and the Whale' by Julia Donaldson this week. We found out that she has written lots of books including 'The Gruffalo'. We learnt how to spell other words with the 'ai' sound in them like trail and nail. We have been thinking about creatures that live in the ocean and started to write stories about an underwater adventure including meeting whales, sharks and mermaids! In Maths we have been practising telling the time and also learnt how to read digital clocks. We have also been counting money and giving change from £1. If you have some loose change you could practice counting money at home! We watched a clip from Deadly 60 showing how dangerous a hippo can be! We have been learning about jungle animals and finding out how they are suited to living in the jungle. We have been authors this week and used our imaginations to write our own jungle adventure stories. We have learnt how to multiply in our maths lessons and have been practising counting in 2s, 3s, 5s and 10s. We could practise this at home too! We have read the story about Elmer the elephant this week and have done lots of activities based on the book. We wrote poems describing Elmer's colours and designed patterns. We have learned lots of interesting facts about elephants too. In maths we have been learning to measure in centimetres and found things in the classroom that were taller and shorter than a metre stick. We all enjoyed our visit to Castle Coch this week. We met a knight who told us all about his training which began when he was 7 years old! He taught us how to fight with wooden swords and we were very good at defending ourselves! We also met The Spellbinder who told us stories from Aesop's Fables. He sang songs and played guitar and had a puppet friend who was very naughty interrupting the story! Children in Need - Wacky Hair, Hats and Wigs! The story of Rama and Sita Diwali celebrates the return of Rama and Sita. The story shows how good wins over evil.